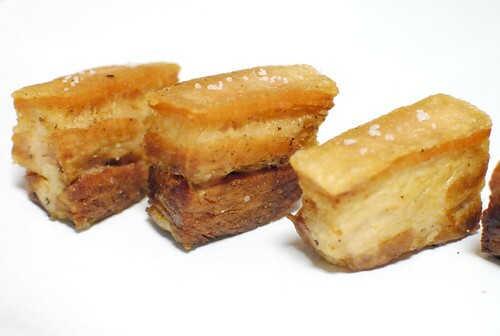 I’ve made pork belly confit once and it turned out great. 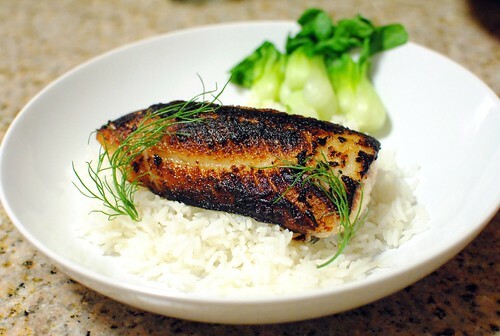 It can be crispy and tender both at the same time, and is usually succulent and full of flavor. However, it was a ton of work, and cooking something in two pounds of lard didn’t make me feel good about my health. Almost a year and a half later, I was inspired to try again…this time sous vide. There would be two big pluses with sous vide. One, I could cook at a lower temperature for an extended period of time. Two, it would require much less fat, since the lard was sealed in a vacuum-sealed pouch with the pork. 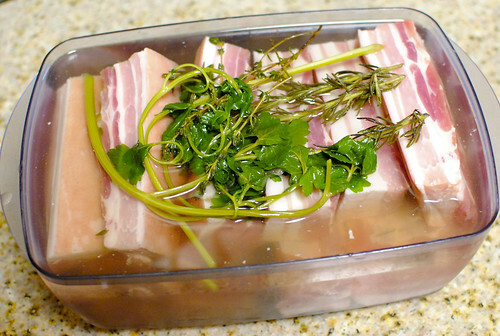 I decided to go with the same brine as before, Thomas Keller’s pork brine from Ad Hoc at Home. The time and temperature took some thinking, and I consulted a variety of sources. Heston Blumenthal recommended cooking the pork at 60C for 36 hours. Thomas Keller opted for 82C for 12 hours. 82c seemed like a higher temperature than I wanted and 36 hours was too much of a test of my patience, so I went right in the middle and decided on 71C (~160F) for 24 hours. I have a pretty big tub for my water bath, so I figured I’d go big. Heck, if I’m cooking something for 24 hours I’d better make a large batch. 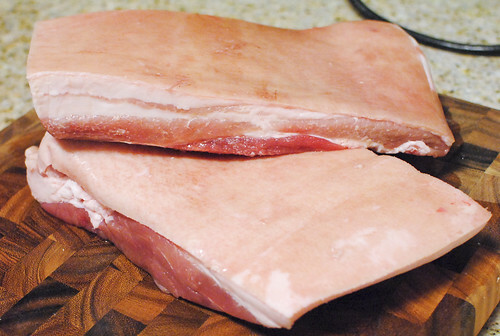 Plus, the cooked pork (stored in its own fat) would stay good in the freezer for a long time. I purchased about 6 pounds of pork belly and got started. 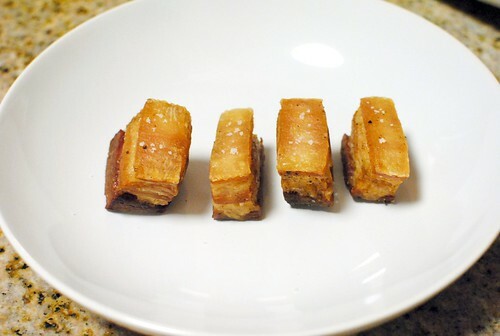 For ease of storage and cooking, I sliced my pork belly into individual servings first, cutting them into neat rectangles. I brined these guys overnight (brine recipe here). After brining overnight, I rinsed each piece of meat thoroughly and dried them off. 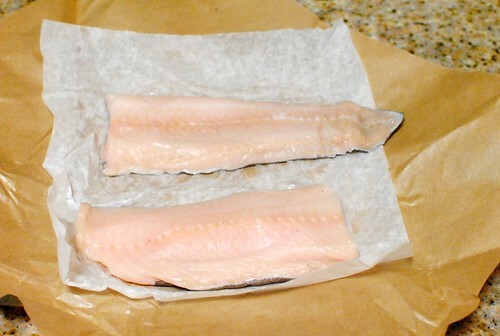 Each piece got its own vacuum-sealed pouch along with salt, pepper, and a generous amount (2-3 tablespoons) of lard. Once sealed, they were ready to take a bath! 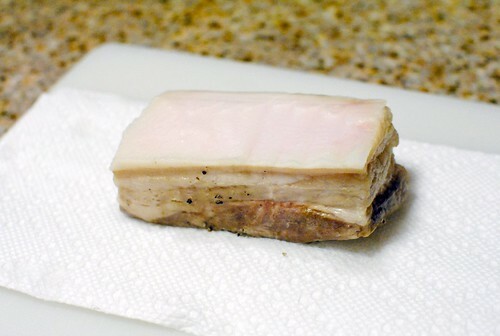 24 hours later, the bags were removed to yield a cooked piece of pork belly and a large amount of fat and juice. I cooled them in a ice bath, putting a weight on top to try to push out any excess fat within the layers. I put some in the freezer and some in the refrigerator, knowing there was no way I was going to consume all of this in a short period of time. 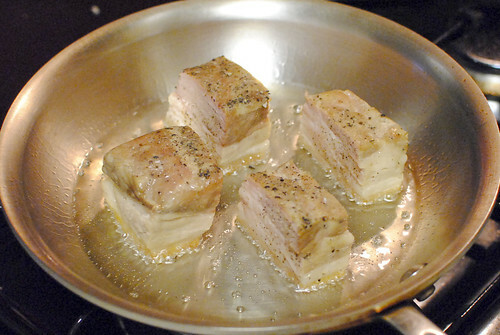 Once I was ready to eat, two main steps came into play: reheating and crisping the pork. 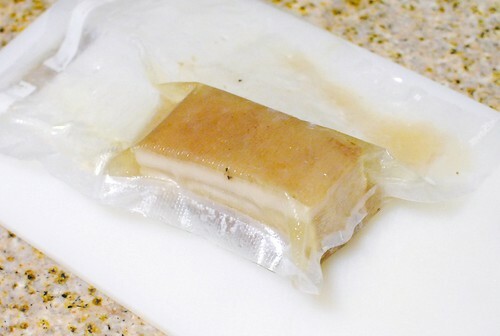 For refrigerated belly (or thawed), I like to heat the pouch up with hot water from the sink – not hot enough to re-cook the pork but hot enough to liquefy the juice/fat and take the chill off the meat. I usually just fill a small pot with hot water and let the bag sit in there for 10 minutes. 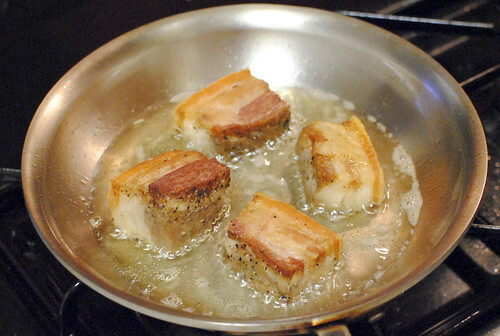 It makes it much easier to drain the pork and dry it off, rather than scraping off the jelly and solidified fat. Also, by heating the meat just a little bit, it would help me re-heat the pork evenly on the stovetop. Sometimes I leave the skin on, but I actually prefer to remove the skin and some of the first layer of fat, leaving a remaining thin layer of fat (something Blumenthal recommends in The Big Fat Duck Cookbook). It reduces the fat:meat ratio considerably, and I find the skin to be a bit chewy sometimes. Searing the fat layer would still yield the crispy texture I was aiming for. It’s all about personal preference though. I next cut my rectangle into smaller pieces…not quite bite sized but maybe into two- or three-bite pieces. More surface area equals more meat/fat to make crispy, and the interior of the meat would heat quicker. 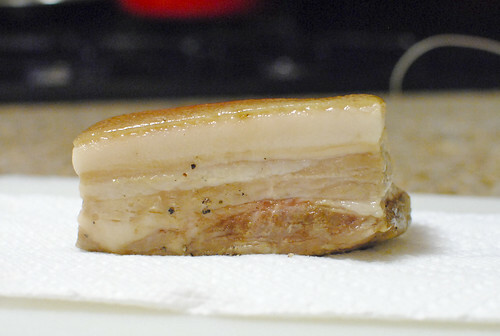 After patting the pork dry, I seared each side of the pork belly, starting with the fat cap. Sometimes I just sear the fat side, sometimes I sear each side. Again, personal preference depending on the amount of texture. I had a bunch of lard leftover so I thought it’d be fitting to fry it in lard, though any oil (preferably neutral) works here. Deep frying would get the job done, but I went with the pan-searing method in order to conserve on the amount of fat used. I pan-fried each side until golden brown, making sure the interior was heated though. This might have been the most important step post-sous vide, as the pork needed to be fully warmed through so as to avoid a cool, gelatinous interior from the fat. Cool fat is never really pleasant. 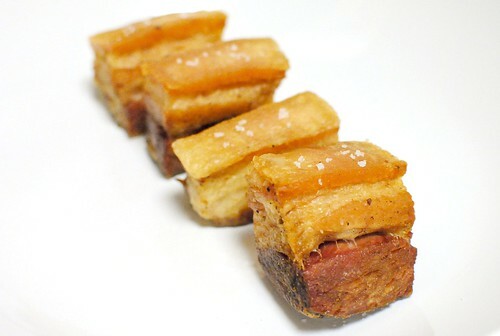 I patted the cooked pieces of pork dry with a paper towel and plated them. Ready to eat! With low-and-slow cooking and a cut of meat this fatty, it’s hard to go wrong. The pork was moist and tender on the inside with a delightful crispiness on the outside. Within each belly there’s definitely a gradient with the fat and muscle – one side is fattier and one side is leaner. For me, my sweet spot is right in the middle, with the perfect amount of luscious fat and succulent meat. It was totally worth the effort. I could see this incorporated in a number of entree-type dishes, but I like to keep the servings on the small side due to the richness. In fact, I’ve been eating many of these as a small snack. 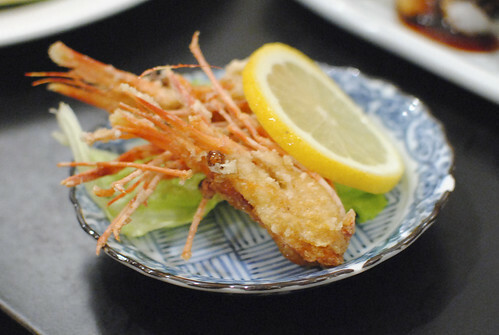 Komasa seems to be one of the most popular restaurants in Little Tokyo, garnering lines as reliably as Daikokuya. 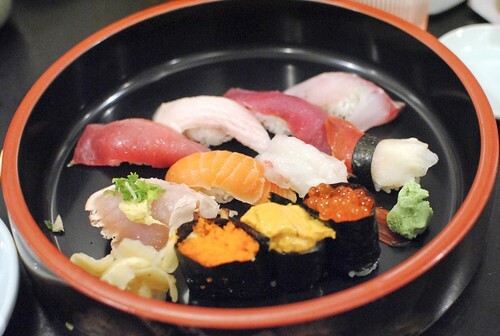 From my perspective, there are a trio of Little Tokyo sushi restaurants that are clearly more popular than the rest – Hama, Sushi Gen and Komasa. The latter two tend to have the longest lines (I largely attribute it to the lunch/dinner specials and lower prices), while Hama tends to be my favorite overall (with the sushi bar at Sushi Gen coming in a close second, and there is a distinct difference between the sushi bar and table service there). It’s been a while since I’ve been; my extreme proximity and the ever-present lines eventually lured me back. Although Yelp’s rating system is inflated, a 4.5 star overall rating on 500+ reviews usually suggests a very promising restaurant. 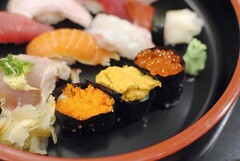 The menu offers much of the standard Japanese fare including teriyaki, tempura and a large variety of sushi and sashimi. There’s also an array of interesting small plates. What struck me and the rest of my party were the prices – very reasonable. 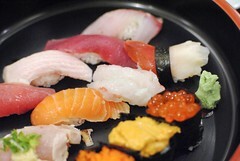 I could easily see someone eating a sushi dinner in the $20 range, maybe even less for a small eater. Hm, the popularity was starting to make sense. We decided to order a number of appetizer/small plates and each ordered Sushi Combination C, the most expensive combo at 11 pieces for $16. 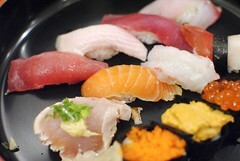 I also tacked on a few orders of a la carte sushi for good measure. 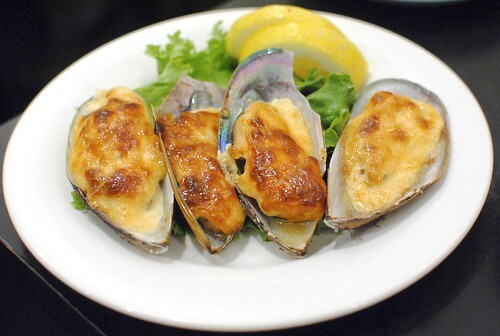 I thought the batter was a touch on the thick side, but the oysters themselves were plump juicy and quite flavorful. Pretty tasty, especially with the flavorful punch of the tonkatsu sauce. Loved the creamy texture, though it was just a bit fishy. 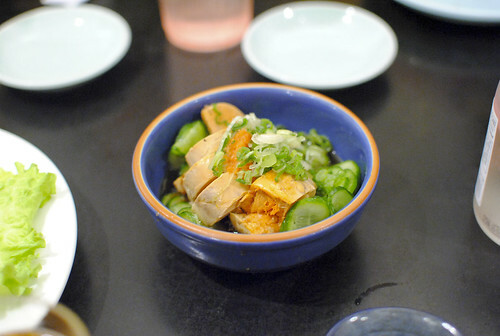 A light soy-based sauce was a nice accompaniment, as were the fresh bite of the scallions and the hit of acid in the sauce. 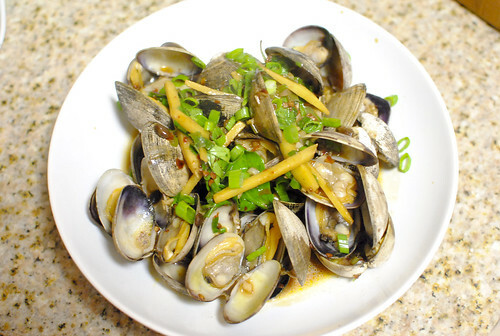 Fairly typical baked mussels, except they were definitely overcooked leaving them somewhat chewy. 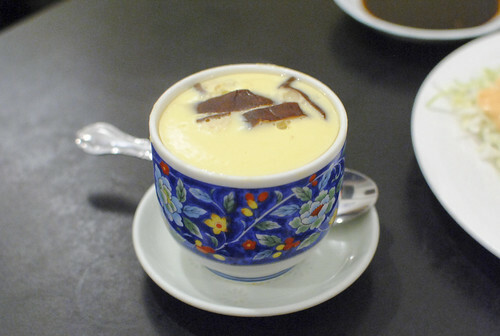 I thought this was a wonderful light custard, warm and comforting. 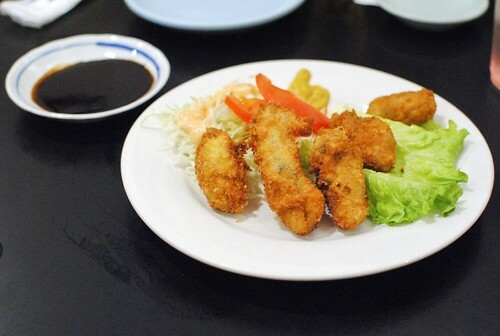 A few chunks of mushroom and fish cake were scattered throughout. Next up was the centerpiece of the meal. There was a pretty good selection of fish with some of the typical players like tuna, salmon, halibut, albacore and red snapper as well as some ‘bigger ticket’ items like sweet shrimp and uni. Pretty good for 16 bucks. Overall I thought the quality of fish was okay; texturally I thought many of the pieces were slightly less tender and a little more stringy/grainy than I wanted. 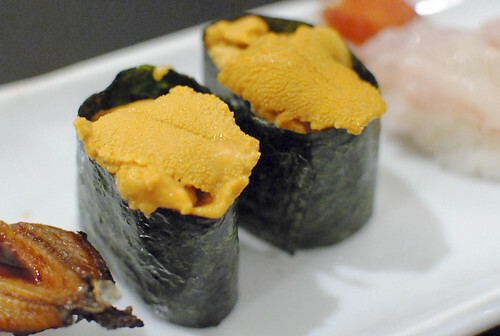 The nori on the uni and fish eggs was on the soggy/chewy side, kind of a downer too. 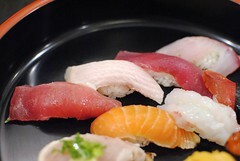 However, I thought the biggest distraction was on the generous wasabi usage – I found myself pausing for air a few times. Still, I suppose it wasn’t bad considering the price. I thought the sweet shrimp was one of the better items in the combination, and it was pretty good here too. Spongy and sweet, it had both the texture and flavor I was looking for. The fried shrimp heads were a nice touch too, and always a fun eat. At $5.50 for a pair, I thought this was a relative steal. The uni itself was pretty good, cool with a mild sea flavor coming through. Similar to the one in the combination, I found the soggy nori to be a distraction. Boo. Also $5.50 for a couple – one of the most reasonable prices around town. 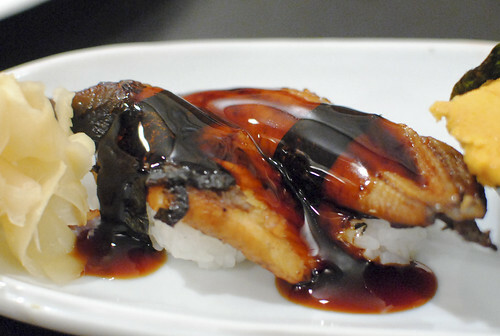 The unagi was a solid variation, tender and flavorful. I thought it looked like it could be oversauced, but it gave just the right amount of sweet accent to the bites. 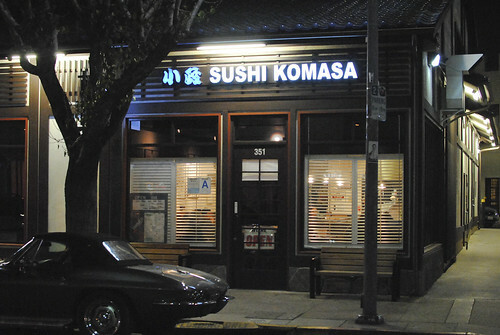 I might be a little bit of a sushi snob, but the sushi at Komasa was just fine, even slightly mediocre at times. Still, for the price I suppose I can’t really complain, as it was just a step pricier than the pre-packaged goods at neighboring Nijiya market. 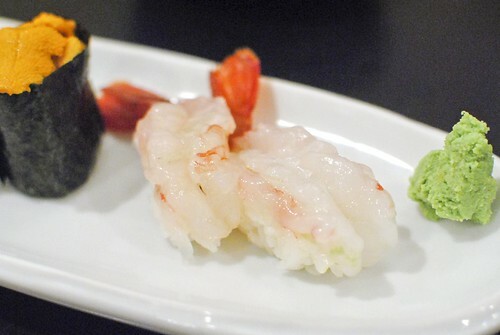 The quality of some fish was definitely superior to others, so I think an experienced regular could craft a pretty good a la carte menu of favorites…so long as they didn’t mind an occasional generous helping of wasabi. While browsing the web for recipes in which to use my sous vide machine, I came across one that struck me immediately. It’s Michael Voltaggio’s recipe for crispy chicken thighs, posted on the Williams-Sonoma database. It’s very similar to a recipe I’ve prepared a number of times that includes brining chicken thighs in a thyme-based brine, letting it air dry in the refrigerator until its completely dry, and finally searing them up in a pan, basting with butter and herbs. Voltaggio’s recipe would be different mainly in that it involved a sous vide application, ensuring very precise and even cooking. Plus, I’ve always found it fun (and more trustworthy) to experiment with recipes from chefs whose food I’ve actually tried and enjoyed (see ink.). 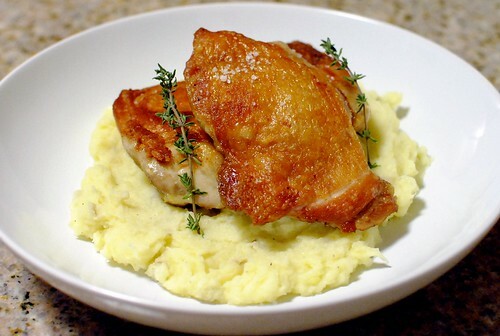 The difference sous vide technique makes to chicken thighs isn’t quite as apparent as say, chicken breast, due to the fact that there’s a larger margin of error when cooking dark meat. When cooking dark meat, my fear is always towards undercooking rather an overcooking, so I tend to cook it a little bit past the point of doneness just to be sure. Cooking the thighs sous vide would help alleviate that, plus it would just be a fun way to continue experimenting with the technique. The first step was a brine. Voltaggio’s recipe doesn’t include a brine and I’m not sure if he was just trying to keep it simple or if it’s just unnecessary (thighs have a ton of fat/flavor on their own). 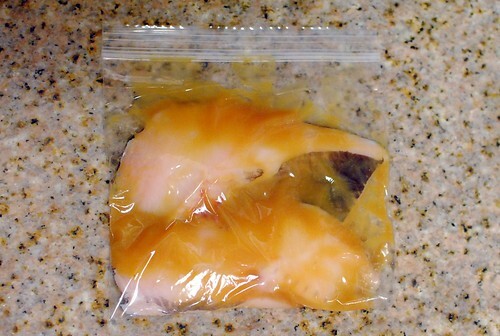 I had time, so I decided to brine half of my chicken overnight and leave the other half as is. Keeping it simple and mirroring the ingredients of the recipe, my brine consisted of salt, sugar, thyme, and garlic. Season the underside of the chicken thighs with salt and pepper. 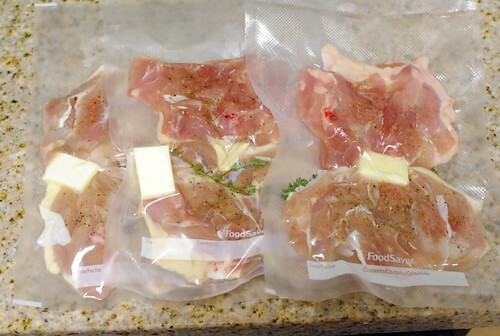 Place the thighs, skin side down, into a vacuum-sealable bag, making sure they lie flat. Add the garlic, thyme and butter to the bag. Using a vacuum sealer, vacuum and seal the bag tight according to the manufacturer’s instructions; be sure you have a smooth, airtight seal. Carefully place the bag into the circulating water and cook for 1 to 1 1/2 hours. Have ready a large bowl of ice water. 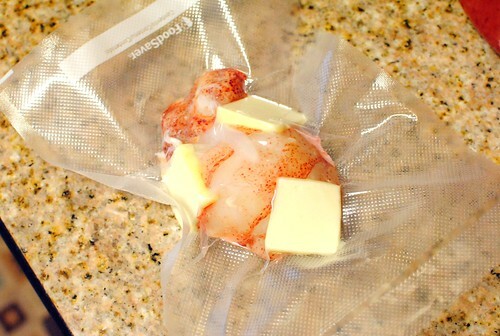 Remove the thighs from the circulating water and place the bag into the ice water for 20 minutes. 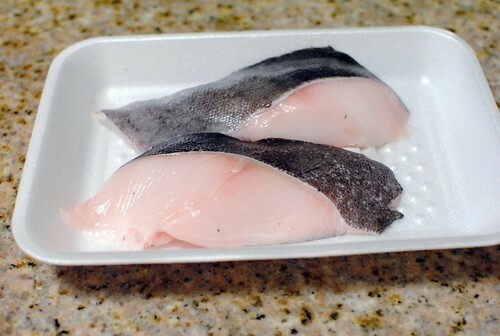 If serving the chicken that day, place the bag on a baking sheet and refrigerate until ready to sear the thighs. 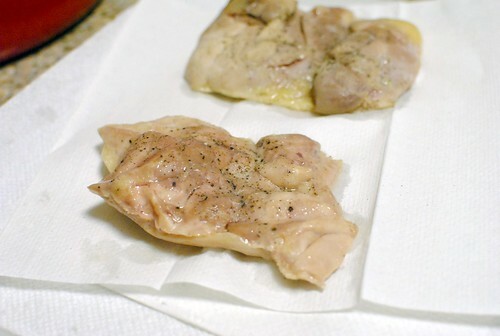 If serving the chicken the next day, place the bag, with the thighs skin side down, on a baking sheet. Place another baking sheet on top and weight it down with a heavy fry pan. Refrigerate overnight. Just before serving, remove the thighs from the bag and pat dry with paper towels. In a large fry pan over medium heat, warm 1 to 2 Tbs. oil. Working in batches, place the thighs, skin side down, in the pan and cook until golden brown and crispy, 8 to 10 minutes. Turn the thighs over and cook until warmed through, about 2 minutes more. Transfer the thighs to a plate and cover loosely with aluminum foil. Repeat with the remaining thighs, adding more oil to the pan as needed. Serve immediately. Serves 4 to 6. I followed each step as precisely as I could:, first by vacuum sealing my chicken (note the “discoloration” of half of the pieces due to the brine). After leaving it in the water bath for about 90 minutes, I took the chicken out. 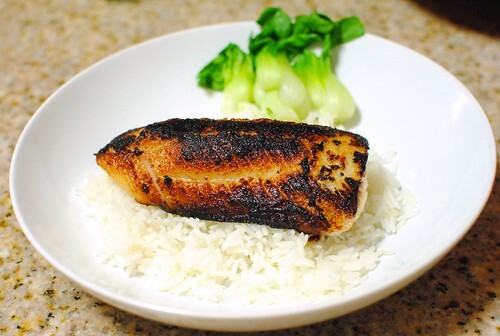 Since the water bath was at 150F, this chicken was not yet fully cooked – the final sear would complete the process. 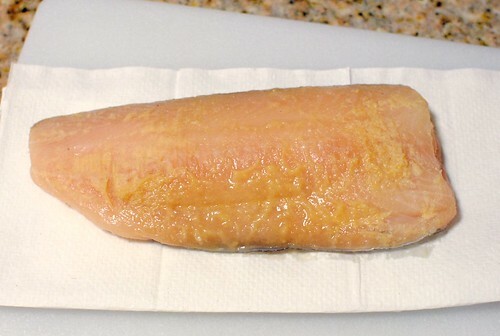 As with most items cooked sous vide, it didn’t look very appetizing, basically resembling a boiled/poached piece of chicken. I dried them out as much as possible, knowing this would be key to getting a crispy skin. 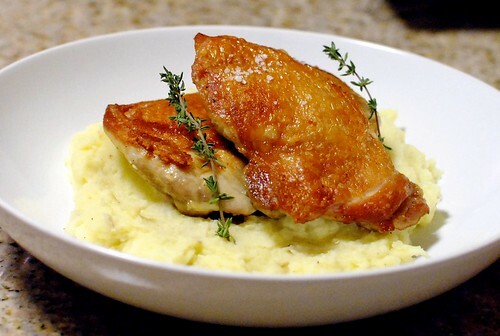 Once crisped up, I placed the chicken thighs atop Yukon Gold mashed potatoes, sprinkled some sea salt, and garnished with a sprig of thyme (just like the picture in the recipe!). I was pretty happy with the results and kind of surprised I was able to get the skin so evenly crispy. I attributed it to ensuring the skin was dry before putting it into the pan, as well as making sure the thighs were as flat as possible throughout the process (ensuring even cooking). The meat was delicious, very juicy and exuding the thyme perfume I was aiming for. Was there a significant difference between the brined and unbrined chicken? No I don’t think so; in fact, I couldn’t really tell the difference. Compared to my old method, I found the meat to have a more uniform texture and temperature…and I knew it was going to be cooked through. 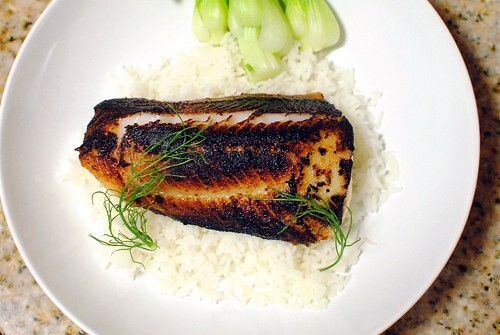 I thought this was quick and easy enough as a weeknight meal; even better, a large batch can be prepared on the weekend and left in the refrigerator to be seared during the week. I’ll definitely be making this again. 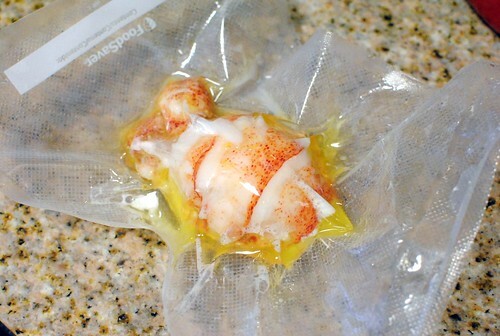 When I first started to cook sous vide at home, one of the things I wanted to make was lobster. 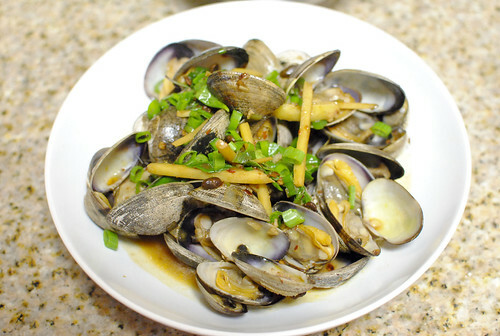 Like most seafood, it can be a bit challenging for me to prepare since it’s so easy to overcook. With sous vide, I could ensure it would be cooked perfectly each time. 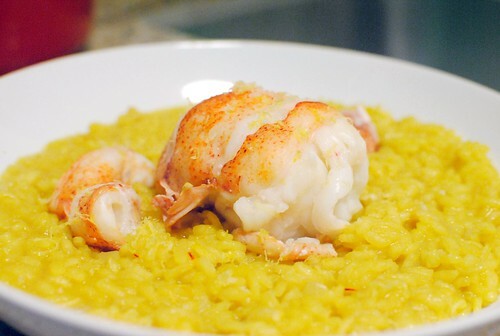 I really like seafood risotto, so I decided to pair the lobster with the rice dish. 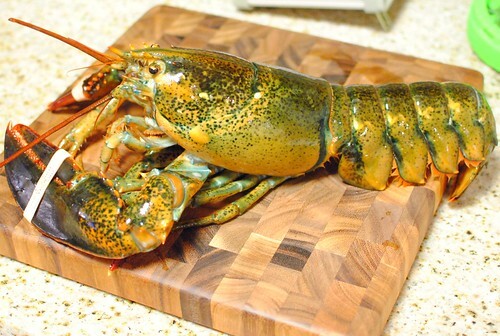 It would be an ideal way to use the whole lobster too, since the body/shell could be turned into a stock for the basis of the dish. 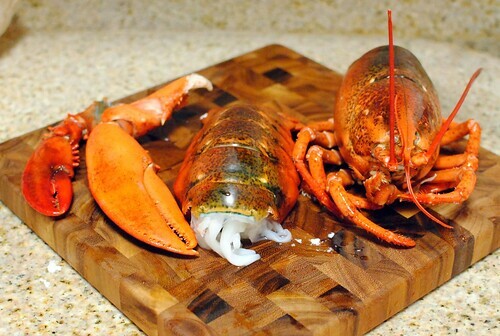 To start with, I purchased a 3+ pound live lobster. As far as I can remember, I’ve never handled a live lobster. In fact, I think this is the first time I’ve had to dispatch anything live for consumption. I’ve read and seen that the quickest, most humane way to kill a lobster is with a knife through the middle of the head; when contemplating that, I felt it was too…direct. So I decided to go with the boiling water method, blanching the lobster for just a minute or two. In short, it had a slow-ish death; I immediately regretted it and was completely disturbed. I hate to say it, but I like to stay removed from the whole process of killing one’s own food. Once blanched, I regained my composure and took apart the lobster by twisting the tail off and pulling off the claws and legs. 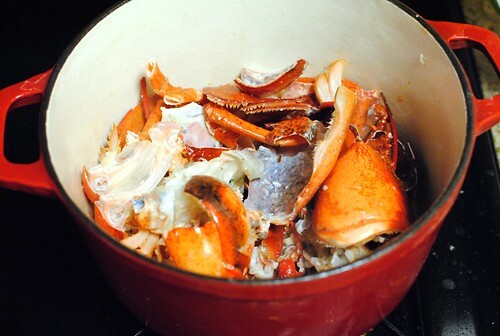 I removed all of the still-raw meat and cut up the shells in order to make a lobster stock. The sight of the whole tail was something else – conjuring up some willpower, I abstained from turning the tail into a lobster sashimi on the spot. 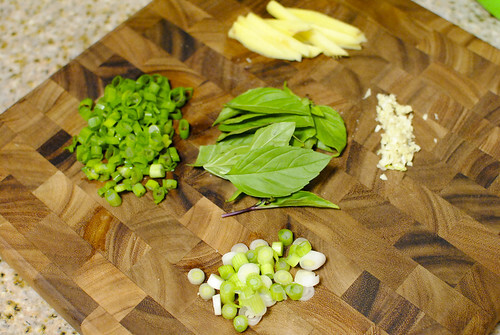 The shells were sauteed, adding celery, onions, carrots, tomato paste, white wine, thyme, fennel fronds and a bay leaf. Finally, I added water to cover and simmered for about an hour and a half. 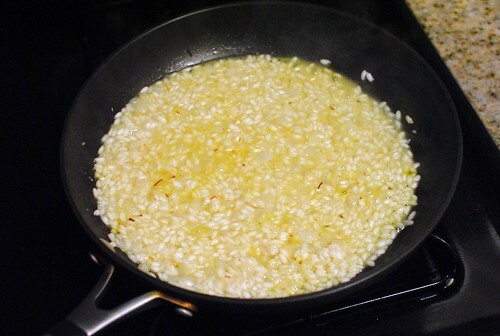 I didn’t add any salt, figuring I would salt to taste in the final stages of the actual risotto. 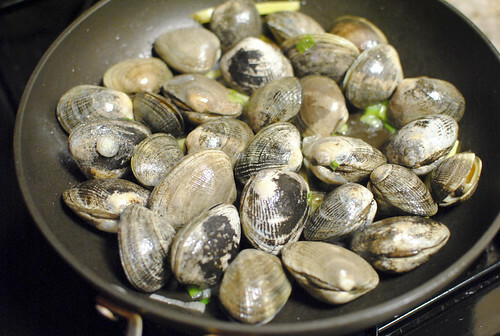 While simmering the aroma of the stock was incredible, making my apartment smell something like a seafood shack. I half expected the neighbors to come knocking for some fresh lobster rolls and chowder. At this point, preparing the lobster meat was probably the easiest part of the entire process. I cut the tail into two portions and combined each portion with one claw’s meat and a generous amount of butter in a vacuum-sealed bag. It would then sit in a 59.5C water bath for about 45 minutes. 1. Bring the broth and water to a simmer in a medium saucepan over medium-high heat. Cover and keep the broth warm over the lowest possible heat. 2. Melt the butter in a large saucepan over medium heat. 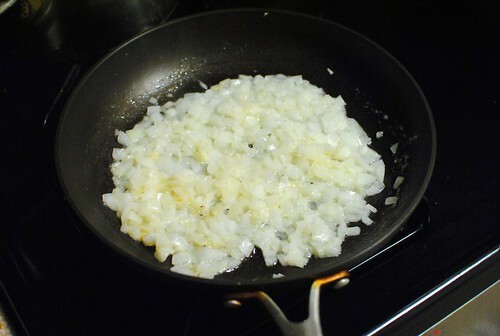 Add the onion and 1/2 teaspoon salt and cook until lightly browned, about 9 minutes. 3. Stir in the rice and saffron threads and cook until the edges begin to turn translucent, about 3 minutes. 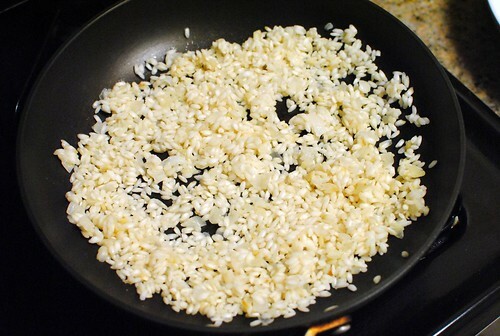 Add the wine and cook, stirring frequently, until it is completely absorbed, about 2 minutes. 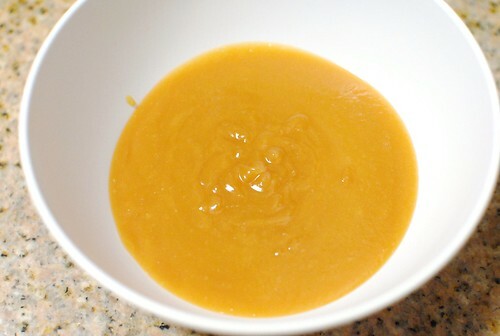 Add 3 cups of the warm broth mixture and bring to a simmer. Cook, stirring occasionally, until the liquid is absorbed, about 11 minutes. 4. Continue to cook, stirring in roughly 1/2 cup of the broth every few minutes, until the rice is cooked through but is still somewhat firm in the center, about 11 minutes. 5. Stir in the Parmesan. Season with salt and pepper to taste. I followed the steps pretty closely with a few exceptions. 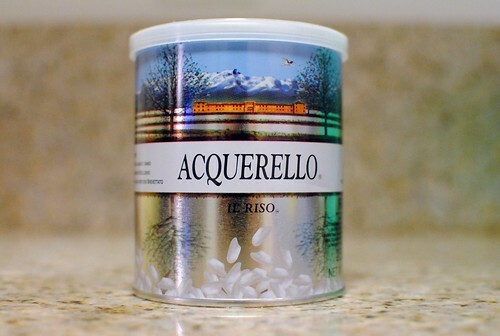 First, I used carnaroli rice instead of arborio. 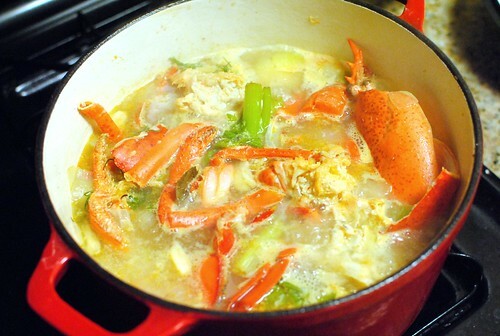 Second, I used my homemade lobster stock (duh!) 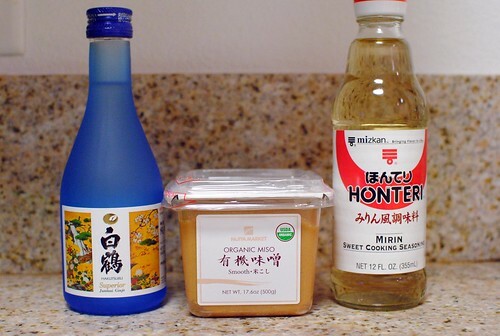 instead of chicken broth, as well as a much higher ratio of stock:water than what’s stated in the recipe. Third, I omitted the cheese. 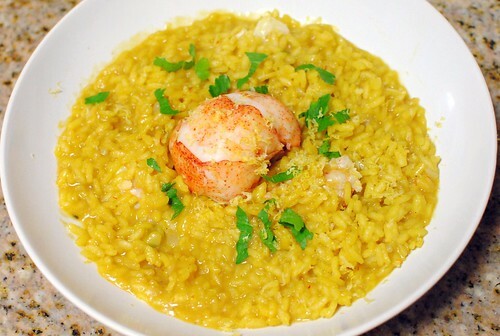 Finally, I plated the risotto, topping it with my lobster, chopped parsley, and some lemon zest. Voila! I was pretty happy with how everything turned out. As expected, the lobster was perfectly cooked – delightfully spongy and sweet. 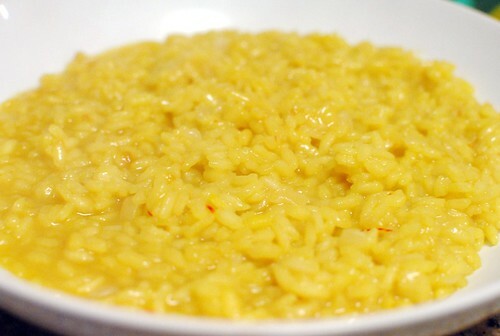 I think the risotto could’ve been a touch soupier, but I was still happy about it. 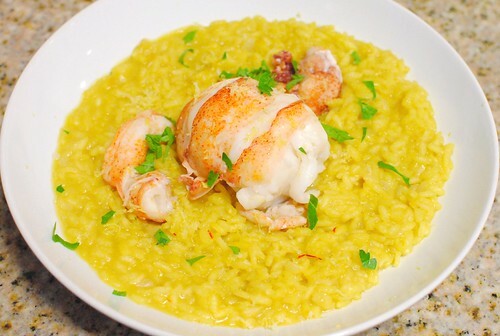 Both the saffron and lobster stock brought a ton of flavor that really made the risotto, and I liked the lemon zest for the fresh citrus flavor without the tart acidity. Looking back, it was a lot of work for one dish but it was pretty damn satisfying and I’d do it again. 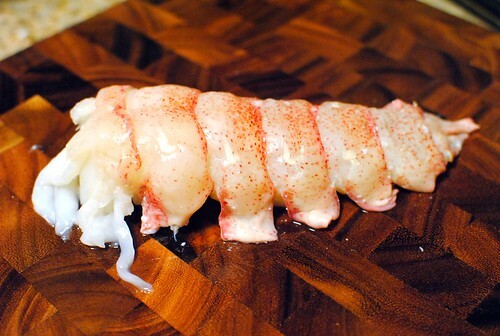 I would experiment with some shortcuts, including using just lobster tails, as well as playing with store-bought chicken/shellfish stock for a dish that would hopefully be close, but much quicker to prepare.